Boyd Barrett has performed his one-man shows since 1980. His unique blend of storytelling, drama, and music has captured the imaginations of adults and children alike. Trouble in Lincoln County, which tells the intriguing story of the Lincoln County War and the last days of Billy the Kid was seen on stage by hundreds of audiences during the 1980s and 1990s. 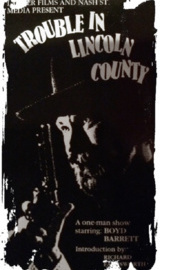 This special creative video treatment of the highly-acclaimed one-man show was filmed in 1990.